Extracted by Joe Shupe from "History of the Corps of Engineers - War Against Japan"
While the engineers were trying to build airfields, the War Department gave them additional jobs - to construct roads and pipelines for a future offensive in Burma. After Stilwell was forced out of Burma, Allied planning for re-entry into Burma was halted because of domestic turbulence in India. This cast doubts of the usefulness of India as a base for military operations. On August 25, 1942, Gen. Marshall warned the combined Chiefs of Staff that only by opening up North Burma could China be kept in the war. The next month, the War Department made a plan for a combined Chinese-British re-entry into Burma. Pres. Roosevelt, on October 14th, stressed the need to open up the Burma Road. Chiang then directed Stilwell to plan the operation; so along with Wavell they set the date of March 1, 1943, as the start of the attack. Wavell told Stilwell that the British could do no more than occupy the western fringes of Burma during the first part of 1943. The plan called for the Chinese to bear the brunt of the fighting. Stilwell's Ramgarh-trained Chinese X-Force would proceed from Assam, and a Chinese Y-Force would advance westward from Yunnan. This would then force the Japanese from a large part of North Burma. The clearing of North Burma would make possible the construction of a road to link India with China. Since Wavell gave the job to Stilwell, his operations officer, LtCol Frank Merrill suggested that on October 28th, that Gen. Wheeler's engineers start to build a base at Ledo to replace the British. He suggested that the most likely route would run east from Ledo to the Patkai Range, then to veer south to Myitkyina and Bhamo (275 miles); then east to the Burma Road about 500 miles. The part from Ledo to Myitkyina (275 miles) was through largely uncharted jungle. Beyond Myitkyina, a one-lane, dry weather track extended to Bhamo. From there a one-lane blacktop road went to the Burma Road. The last 275 miles would be the toughest. Merrill believed that the first stretch should run "east from Ledo to the Patkais; then south to Shingbwiyang - about 120 miles. Shingbwiyang would be the staring point for the coming offensive. On October 29th Stilwell told Wheeler to carry out Merrill's plan, and that he wanted the road open to Shingbwiyang by March 1, 1943. 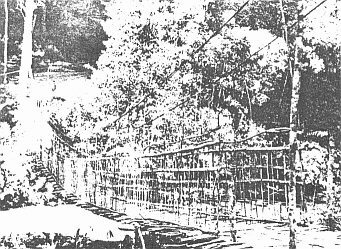 Then Stilwell went to Chungking to persuade Chiang to assemble a force along the Salween River; also to start construction of the demolished Burma Road to Western Yunnan. Chiang agreed to use 15 divisions (the Y-Force) along the Salween, but he reserved the right to cancel the offensive if the British Navy did not do its part in preventing the Japanese from reinforcing its forces through the Bay of Bengal. Stilwell called on Wheeler to discuss with the Chinese toward forming a services of supply (SOS) to support the Y-Force, in addition to developing the necessary roads. An example of the amount of human labor that was necessary to build an airfield in the CBI. Earth was moved in the same may it had been for thousands of years. Note rollers pulled by crew of coolies. Surveying party planning for a portion of the Ledo Road across abandoned rice paddies. Wheeler, on October 29th, placed Col. John Arrowsmith in command of the Ledo Base and road projects, and instructed him to prepare the necessary plans. After consultations at New Delhi, Arrowsmith's plan was to use the "refugee route" which the British used in withdrawing from Burma; roughly the same route recommended by Merrill. The road was to be all-weather, one lane with turnouts. At the time, there were but three engineer units in CBI, but only part of the equipment of the 823rd and 45th Engineers had arrived, and only that of the 823rd was heavy enough for road construction. So Arrowsmith asked Wheeler to request that the US, among other units, a general service engineer regiment, a maintenance company and a depot company. He also asked for several thousand tons of equipment including 40 D-7 bulldozers, 20 H-20 steel bridges and a six months supply of spare parts, to reach Ledo by March 1, 1943. After a reconnaissance with the British of the area concerned, he made his plan for the road. On November 7th, Stilwell was given a road construction plan. Stilwell approved it, and a message was sent to Washington for the needed troops and equipment. Then came the hard part, implementing the plan. The 45th and 823rd Engineers were alerted early in November, but it would take a month for them to arrive at Ledo. To get started, the British, in the middle of November, put several hundred natives to work on extending the road out of Ledo. Later that month, an Indian excavation company arrived to help. Arrowsmith directed LtCol James W. Sloat of the 45th Engineers, and Maj. Robert Hirshfield (Base Sec. #1, Engineer), to start the work. The British showed little enthusiasm for the forthcoming offensive or for the construction of a road out of Ledo. Wavell's staff felt they could not spare the resources to tide the Americans over until March; they felt that they had been taxed to the limit to build or modernize 222 airfields, develop training centers and other installations for the expanding Indian Army. They were also directed to provide resources for the 8th Army in Egypt. They somewhat felt that mud and malaria would drive us out of Burma. Arrowsmith, on November 2nd, said that he intended to carry out the project even if he had only one man. Meanwhile the Chinese showed little inclination to proceed with their part of the job. Unknown to Stilwell, they became enarmored with Chennault's new plan for a air offensive in East China. This appealed to the Chinese because it involved little or no effort on their part. During the last week in November, Stilwell learned that the War Department was halving his request for troops and equipment because of a shipping shortage. Despite this bad news, Gen. Wheeler concentrated on organizing a SOS for the Y-Force. He placed Col. Fabius Kohloss in charge at Kunming to work with the Y-Force toward this end. He put his engineer, Maj. Louis Dawson to work with a Chinese highway agency to reconstruct the Burma Road in the rear of the Chinese divisions which would be moving south against the Japanese in Burma. In December 1942, Gen. Marshall declared that a dependable line of communication with China was needed so that air operations could proceed to destroy Japanese shipping and sources of supply. But before this could be done, the Chinese, with the help of the British, would have to advance in order to clear the area for a road. The Combined Chiefs of Staff gave them a priority surpassed only by that of the North African campaign, then in its critical stage. Marshall then gave Stilwell some hope on December 10th that the requested 6,000 engineer troops and 63,000 tons of road equipment could be delivered to Ledo by early March. Arrowsmith, early in December, assumed command of the Ledo area. At the time, the British were barely making headway. An advance element of the 45th Regiment, arrived in late November, the rest of the unit and the 823rd Battalion, to arrive early December. Dissatisfied with the slow progress, Arrowsmith made Col. Sloat the "Road Engineer." Then the road work speeded up. In December, Gen. Wheeler activated Base Section #3 at Ledo. Arrowsmith was now in formal command of the road work on the Ledo Road, as it was henceforth called; also he continued as Engineer, SOS. Since the frontier was mostly uncharted, several from the 823rd were sent to Arrowsmith's headquarters, to make the needed maps. Maj. James Walker set up a supply depot at Likhapani, four miles east of Ledo. Maj. Hirschfield took over as base engineer and started converting Ledo into a major supply point. The Chinese divisions and US service troops expected soon would be bivouacked in the tea estates. The "refugee trail" appeared to be the best route since it had been used for many years as a caravan route. An alternative was the route of a proposed railway which has been surveyed 20 years earlier. The latter route was later eliminated because it would have required large tunnels and long river crossings. By late December, the road team had taken shape. The 823rd Engineers were in charge of reconnaissance. Several Royal Engineer surveyors helped select the right path. Most of the 823rd followed close behind; clearing a roadbed through the jungle. They had six bulldozers, all without blades, which they had to borrow from a British unit. When one bulldozer was sent back for repair they took the blades off and put it on a good bulldozer. The 45th then followed and did the final grading and graveling. A British unit worked briefly on the road. The pace picked up and the 823rd graded five miles during the first week of December. By mid-January 1943, the lead dozer was 30 miles from Ledo and nearing the mountains. Progress was faster after Arrowsmith got two more blades from Lahore. Chinese troops then moved in to protect the road force. The road was very windy; this was inevitable because of the way it was being built. First they bulldozed a narrow path through the jungle. Then they moved up more equipment to clear out trees and underbrush on both sides, and lastly they fit the road into the best part of the clearing. 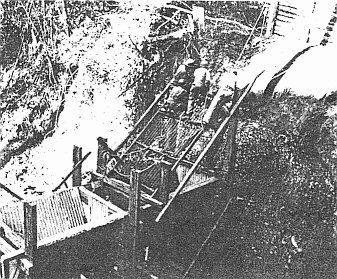 Because the light dozers of the 45th could not always cope with the rugged terrain, detours had to be made around the large stumps which the machines could not pull out. They put up temporary bridges and culverts at the minor water courses. In the flat sections, the road could easily take two lanes of traffic, but on the sides of hills it was quite narrow. On January 21. 1943, graveling had reached Mile 26. Stilwell was jubilant about the progress at that point. 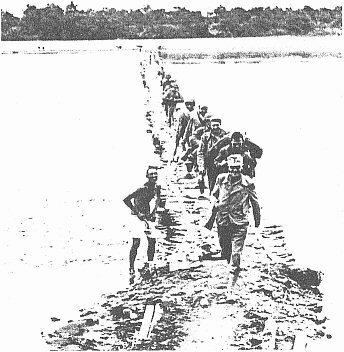 Progress continued during February, but at a much slower pace; they reached Pangsau Pass on the Burmese border at month's end - 38 miles from Ledo, but still some 80 miles from Shingbwiyang. The slowdown was caused by the rugged terrain of the Patkais; greater effort was required to widen the road and slope the high banks. In mid-March, an early monsoon temporarily halted work; the road was so sodden that trucks could not get through. Natives had to be used to carry supplies to the 823rd. After the weather cleared, operations were back to normal, but by the end of the month, they were still short 70 miles from their goal. Since the monsoons were approaching, Arrowsmith hoped to get his first reinforcements before it struck. Early in March, the 330th Engineer General Services Regiment, the 479th Engineer Maintenance Co., and a platoon of the 456th Depot Co. arrived in Bombay. Only the depot platoon was on the road by the end of the month, and took over operation of the engineer depot at Likhapani. Gen. Wheeler got the Chinese to send in their 10th Independent Regiment, which arrived in mid-March to clear the jungle and to do pioneering work ahead of the 823rd. During March and April, the 823rd's blades and the D-7 tractors and other heavy equipment arrived at Calcutta and began moving up to Assam; but whether they would arrive before the monsoons was doubtful. Early in April, Stilwell visited Ledo and expressed dissatisfaction with the progress thus far, and wanted more effort to provide better housing. He believed Arrowsmith was concentrating too much on the road to the neglect of providing access roads in the base and preparing supply trails for jeeps to Chinese outposts along the eastern slopes of the Patkais, but after considering the critical shortage of troops and equipment, he finally said he had no business to criticize. The monsoon, unusually early, was in full swing by the first week in April, so top priority was given to sloping, widening and ditching. Late that month, advance elements of the 3305th Engineers came up to reinforce the 823rd. The 1st Battalion of the 45th Engineers then turned to road maintenance, while the 2nd Battalion moved back to Ledo to repair access roads. By May the engineers were trying to restore or save more than 120 miles of roads in and out of the base. Fortunately before the rains came, permanent bridges were in place. We and the British put in steel spans over the larger rivers, while the Chinese engineers built timber bridges over the smaller streams. The monsoons struck just as the condition of the equipment was nearing an all time low. There were almost no spare parts. Some equipment arrived from Calcutta, but the greater part would not arrive until summer. By the end of April, one-third of the 823rd's tractors and trucks were awaiting parts. A month later, about two-thirds of them were out of service. The 45th Engineers fared no better. All of this meant that they were unable to extend the road much beyond the Mile 50 mark during the remainder of the monsoon. In China, likewise, work on roads was the main concern during the first months of 1943. We and the Chinese generally agreed that the main Chinese drive would follow the route of the Burma Road toward Lashio. A secondary route would follow the partially completed right-of-way of the Yunnan-Burma railway. The latter route left the Burma Road near Mitu some 225 miles west of Kunming and wound south through the mountains east of the Burma Road. Col. Kohloss believed the Chinese should establish a depot along the Burma Road, and that the road itself should be put in shape. Also, they should build a highway from Mitu into Burma. He also tried to persuade the Chinese Y-Force commander to organize an SOS. In the winter of 1942-43. Kohloss and Dawson found much apathy towards reaching those goals from the Chinese officials because of the runaway inflation and their technological backwardness at the time. Dawson's main job was to help the Chinese improve the Burma Road. He first made a reconnaissance of the area and found that the road was not a highway in the American sense. He noted that each local district built its section as cheaply as possible; it was two lanes in some sectors, but poorly surfaced and partially demolished. The surface for the most part was crushed rock and clay, with some sections asphalted but in poor condition; dusty when dry and slippery when wet. Dangerous hairpin curves were frequent, grades were steep, and shoulders were eroded. There were 14 passes higher than 7,000 feet. The bridges were usually one-lane, and lower than the level of the road, and some had superstructures of rotting wood. The more he saw, the more he was convinced that only a major construction effort could put the road in shape. With the above information, in late February 1943, Kohloss got the commander of the Y-Force to make a 430-mile-inspection-trip; they took along a senior Chinese engineer. The Chinese then agreed to accept Dawson's participation in their planning work. At the same time, the Chinese Highway Administration, at our urging, ordered a thorough road survey, the first in the road's history. Dawson also got the Chinese to promise that they would get their mechanical equipment repaired in order to do the road job. to be used on the Ledo Road construction project. In the latter part of February, Dawson and his Chinese counterparts completed their cost estimates. Their estimate almost 80 million dollars to improve the 370 miles stretch between Kunming and the Mekong River and about 38 million more to restore the 226 mile stretch from the Mekong to the Burmese border (total of almost $6 million US). But then there were the uncertainties of the runaway inflation at the time. As a result, the Chinese almost tripled Dawson's estimates. The figure eventually agreed upon was 300 million Chinese dollars. This estimate was sent to Chungking; so there was nothing to do but wait. Then followed a long period of inactivity. The few workers on the road stopped work when the April rains started. Then in May, a new group of Chinese administrators took over from which Dawson encountered more indifference, so little action was taken. 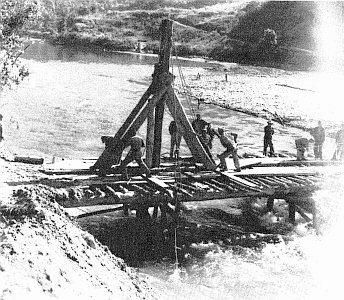 As a result, the only solid engineering achievement of the first half of 1943 was a 160 mile reconnaissance of the route out of Mitu to a point 50 miles west of the Mekong which was carried out during April and May by one of Kohloss' deputies. Underlying the official apathy was the Chinese disagreement with our strategy - the need for a successful campaign in Burma to make possible ground communication between India and China. The Chinese were far more interested in aerial supply and air power. However, they displayed a different attitude toward airfield construction. Back in November and December 1943, Yunnanese officials impressed thousands of coolies to enable the Yunnan-Burma railroad organization to complete the airfield at Chengkung. Chiang himself ordered a bonus paid to the coolies. By late January 1943, advance Section #3 had three transport fields in operation at Chengkung, Kunming, and Yangkai. By spring, Capt. Harry Kirkpatrick, Advance Section #3 engineer, began making improvements at two fields near Kunming formerly used by the AVG (Chanyi and Yunnanyi). By May 31st, major construction at Yunnanyi was completed; progress was slower at Chanyi. Ever since Col. Holcombe went on convalescent leave in June 1942, Stilwell had been without an engineer on his New Delhi staff. When Holcombe returned to duty, it was as Gen. Wheeler's deputy. The position was refilled on January 3, 1943, by Col. Francis Newcomer, but he soon concluded that his office was unneeded in India because Arrowsmith, as SOS engineer, had the major engineer role in India. The problem, however, was that Newcomer could not exercise much control over construction in China. Consequently, Newcomer was transferred to Chungking. His job was to work with the Chinese on airfield construction, mapping, supplying Chinese troops at Ramgarh and in Yunnan, and housekeeping for our rear echelon in Chungking. Since our main engineer effort in late 1942-early 1943 was directed toward opening ground communications across Burma, the airfields in India received little attention. Work on them was beset with difficulties and slow rate of progress, especially in Central India. This severely strained relations among the engineers, the 10th AF, and the British. Keeping an anxious eye on the bomber fields near Calcutta, Gen. Bissell, during December 1942 and January 1943, repeatedly complained that the engineers failed to regularly inspect the work being done by native contractors. Maj. James Hyland, area engineer at Chakulia, said that he and his one assistant were giving a "pro rata" share of their time to each of the five fields in their area. Hyland complained that progress was slow because of the inefficiency of many of the native contractors, and the inability of the Indian Public Works Department's few engineers to give effective supervision. Work on the four Hump fields in Assam was left almost entirely to the British since the start of the other Ledo projects. The plan to complete work on the fields before the rains could not be carried out. From our point of view, the British failed to give adequate priority to these fields. British authorities persisted in diverting resources away from the airfields. On March 3, 1943, Maj. Byroade said that only about 75% of the work would be completed on schedule. Holcombe complained on April 28th to the new British engineer-in-chief, Gen. Roome, that they should make every effort to complete the airfields. Col. Frederick Strong took over as Engineer, SOS, in April, so that Arrowsmith could give full attention to the Ledo Road project. Things seemed no better at Karachi, where there were many differences of opinion between the engineers, our airmen, and the British. Indian officials complained that SOS engineers slowed construction by stopping work at sunset, and by refusing to mix concrete by hand when mechanical mixers were out of order. Maj. John Notling, Hirshfield's successor as base engineer explained that he stopped work at nightfall because of insufficient lighting and he would not allow mixing by hand because inexpert native labor might unwittingly cause a runway failure. As 1943 wore on, there were few signs that an offensive in Burma was near. Stilwell thought that the British were pessimistic and obstructionist about it. Chiang wrote to Pres. Roosevelt in January that he was in favor of Chennault conducting an all-out war against Japan as a substitute. At the Casablanca Conference, in January 1943, Gen. Marshall argued for an early rescheduling of the invasion of Burma. At the close of the Conference, the Combined Chiefs of Staff approved planning for a ground campaign to start in November 1943. Roosevelt gave strong support to Chiang's views, despite opposition by Marshall and Arnold. He directed strengthening of Chennault's air force "to see that . . . (he) gets a chance to do what the believes he can do." On March 3rd, Roosevelt nominated Chennault as Brig. General. Eight days later Stilwell activated the 14th AF under Chennault. Gen. Wheeler then set up an Advance Section 4, SOS, at Kweilin. Major Price was placed in command with the mission of building six bomber fields around Kweilin. On 14 April 1943, Stilwell and Chennault went to the TRIDENT Conference to advise Roosevelt and Marshall. Two weeks earlier, Chennault greatly impressed the President when he said he could "sink and damage over a million tons of Japanese shipping, if he could get 10,000 tons of supplies over the Hump." Stilwell's plans to reform the Chinese Army and the reconquest of Burma failed to fire the President's imagination. So, Roosevelt went to the Conference apparently committed to Chennault's program. On May 9th, Wheeler was ordered to rush construction of airfields in Assam by September so that Chennault would get the supplies he wanted. TRIDENT reduced the campaign in Burma to air-ground action after the 1943 rains, and limited it to North Burma. Stilwell: ". . . everything was thrown to the air offensive." TRIDENT meant that the airfields would again require a major effort by the engineers; later they would be required to support an offensive in North Burma, that is if the resources were available. Also, they would have to continue the work on the road from Ledo to Kunming. TRIDENT conferees decided that the road would also include telephone and telegraph systems, auxiliary airstrips, depots, and hospitals. In February 1943, the War Department SOS Commander, Gen. Somervell, stressed the need for a pipeline. At TRIDENT, authority was granted to start such a pipeline from Assam to Kunming, to be built by the few engineers in CBI, with such help that could be obtained from the British and the Chinese. By early June 1943, Major Price planned more construction on seven fields near Kweilin. This would provide communications facilities, repair shops, taxiways, revetments, and housing for 1,500 airmen. Six fighter strips nearly were to be improved. Byroade, who relieved Price early in August, reported to Wheeler that work was proceeding slowly. The local government was so disorganized, it was at times difficult to know who to deal with in the selection of contractors. 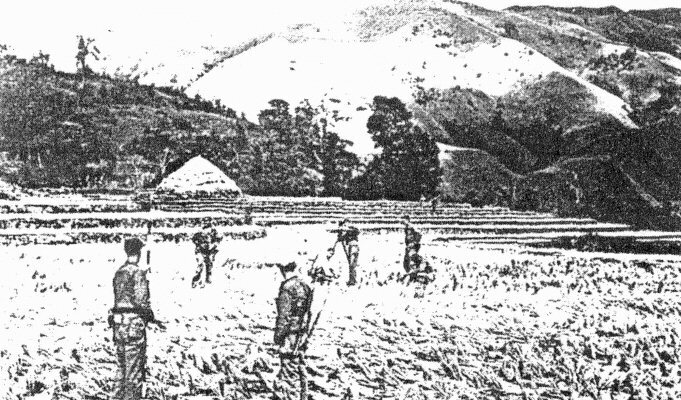 The engineers wanted some of their own men from Kunming and elsewhere to work on the fields. The construction of fields at Kanchow and Singcheng was delayed because local officials favored their own cronies for "squeeze" purposes of American funds. Regarded as proper in China, "squeeze" was considered racketeering by Americans. In August, Byroade put his own contractors at work in Kanchow; they were put in prison by local authorities; so that was out. He henceforth had to deal with local contractors and pay a higher price because of "squeeze." After TRIDENT, the main objective was construction of some 12 transport and fighter fields in Assam. Marshall told Wheeler on May 22nd that four fields were to be ready by July 1st, so that 7,000 tons a month could be sent to China. This required the most strenuous effort, but there was hope that it could be achieved. The War Office in London sent a harsh message to GHQ (India) directing a speed-up of work in Assam. We were then told that Wavell's staff was marshalling the necessary resources to do the job. But, later they said that they would like for us to take over provided that we could bring over the needed men and materials. Wheeler tried to carry out the goals of TRIDENT by borrowing men from the 330th Engineers and bulldozers and other equipment from units working on the Ledo Road. While some progress was being achieved, the work never caught up with the schedules. By July 1st, three of the runways were completed; four others needed extra steel plank, and three others had only been graveled. As a result, the transports could only deliver up to 4,500 tons in July. Burma's rivers presented a major logistical problem for troops fighting in the jungle. Both bridges and boats were scarce, and Allied engineers had to build hundreds of teak-log barges that looked to one officer "like Noah's arks without the houses." Each barge carried 10 tons of equipment, and three of them lashed together could ferry anything up to a Sherman tank. To tow the barges, tugboats were transported to crossing sites in sections, then welded together on the riverbanks; outboard motors to power the barges were flown in from Calcutta. When floods destroyed existing bridges, replacements were quickly erected. One unit constructed 40 bridges in 40 miles. Spans were built of everything from simple planks to 150-girders, including parts hauled by truck more than 300 miles across the mountains. Salvage operations dredged up Japanese landing craft, even small steamers. Everything that floated was put to use. But often it remained for soldiers and pack animals to ford Burma's waterways on their own.